Emergency electrical problems can strike suddenly without advanced warning. Some electrical emergencies such as power outages are a great nuisance while others are life threatening by causing fires or generating hazardous electrical currents. 24 hour emergency electrical services are designed to provide fast protection against dangerous electrical complications. 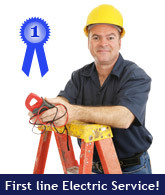 Find here the following 24/7 emergency electrical services by electricians in your area. Submit your job description to contact a 24/7 emergency electrician ASAP. In times of emergency, you need to know who to call to the rescue. As every second counts, it's highly recommended to have the contact number of a professional 24/7 emergency electrician handy. This way you can directly contact the technician rather than waste valuable time scanning your local electricians directory while the emergency spins out of control. Bear in mind that an emergency situation does not allow you to ask for electrician quotes before selecting an affordable technician. The emergency electrician arriving on the scene will do his utmost to take care of the problem at hand quickly and efficiently.